Here at Oakleaf we appreciate that the Bedroom is a very important space in your life, it is where you recharge your batteries and share some of your most intimate moments. Therefore it is important that clutter is kept to a minimum and adequate storage space is available for your belongings, creating a space that lets you both relax and unwind. 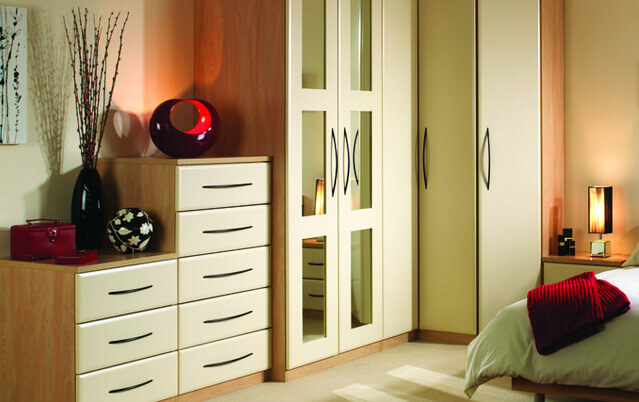 Our extensive range of traditional styles through to the latest chic designs allow us to create and tailor your bedroom furniture to your exact requirements. Whether it be sliding doors or a sloping roof our aim would be to fully maximise the space available. Oakleaf offer a free no obligation quotation service, so whether its transforming a spare room or an unwanted space beneath your stairs it's never to early to get us involved and perhaps provide some inspiration. Once the survey has been completed it will then be incorporated into our CAD programme to produce a plan and detailed elevations of your proposed project, along with a detailed quotation. These plans and costing's will then be thoroughly discussed with you to make sure your project has been portrayed exactly how you imagined it. We always feel privilaged when you invite us to carry out any work in your home.That is why our highly skilled fitting team take the utmost care during installation to ensure that everything runs smoothly, efficiently, tidily and with the least disruption to you as possible. Once the project is completed and handed over to you, we welcome any comments on our performance, and are then always available to contact should you require any after sales service.